The word "cyborg", coined back in 1960, refers to a being which incorporates both mechanical and organic parts usually with the idea of an organism having enhanced abilities due to technology. The older crowd (Older? What the heck does that mean?) are probably acquainted with the seventies television series The Six Million Dollar Man where lead character, Steve Austin, is badly hurt in a plane crash but comes back as something of a super-human having had his right arm, both legs and his left eye replaced by bionic implants. In these more modern times, who's not familiar with the Borg of Star Trek or the Terminator? Spence contacted an engineer in 2009 to work on the idea of building an eye camera. Step number one turned out to be asking an ocularist to make a mould of the eye to figure out how much space they had to work. This turned out to be tiny, very tiny. Fast forward to 2011 and the release of the game Deus Ex: Human Revolution from the computer game developer Eidos Interactive, now part of Square Enix. Set in the year 2027, the story is about Adam Jensen who is horrifically injured in an attack and ends up with many parts of his body replaced by technology. The company Square Enix, to promote their game, commissioned Rob Spencer to make a trip around the globe to investigate the field of prosthetics. The 12 minute video posted on YouTube is a bit of an eye opener to those of us who have never had to deal with the tragedy of losing a body part. Yes, there's the problem of coping but then there are the surprising advancements in technology which clearly point to a future not unlike what was conjectured in The Six Million Dollar Man and further explored in the game Deus Ex: Human Revolution. To celebrate the launch of critically acclaimed video game DEUS EX: HUMAN REVOLUTION, Square Enix has commissioned filmmaker Rob Spence aka Eyeborg (a self proclaimed cyborg who lost an eye replaced it with a wireless video camera) to investigate prosthetics, cybernetics and human augmentation. How far are we from the future presented to us in DEUS EX: HUMAN REVOLUTION? Deus Ex: Human Revolution is a computer game. The Six Million Dollar Man was a television show. However the idea of replacing body parts with technology is very real. It is no longer the wooden peg of your tradition cinematic pirate but a functional, computer enhanced replacement part which is getting closer to mimicking the real thing. While there is still a long way to go before these technological prosthetics replace all the functionality of an actual body part, the current stage of development shows clearly that the stuff of science fiction is slowly turning into science fact. Yes, we will eventually see a six million dollar man but by then, one would expect the price to have dropped considerably. 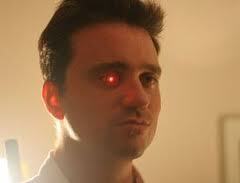 Rob Spence (also known as "the Eyeborg guy" and "Robert Spence") is a film-maker based in Toronto, Canada. As a teenager, he lost his eyesight in his right eye due to a shooting accident on his grandfather's farm. He has decided to embed a small video transmitter camera in his prosthetic eye. The Six Million Dollar Man is an American television series about a former astronaut with bionic implants working for the OSI (which was usually referred to as the Office of Scientific Intelligence, the Office of Scientific Investigation or the Office of Strategic Intelligence). The show was based on the novel Cyborg by Martin Caidin, and during pre-production, that was the proposed title of the series. It aired on the ABC network as a regular series from 1974 to 1978, following three television movies aired in 1973. The title role of Steve Austin was played by Lee Majors, who subsequently became a pop culture icon of the 1970s. A spin-off of the show was produced, The Bionic Woman, as well as several television movies featuring both eponymous characters. A cyborg is a being with both biological and artificial (e.g. electronic, mechanical or robotic) parts. The term was coined in 1960 when Manfred Clynes and Nathan Kline used it in an article about the advantages of self-regulating human-machine systems in outer space. A deus ex machina (Latin: "god out of the machine"; plural: dei ex machina) is a plot device whereby a seemingly inextricable problem is suddenly and abruptly solved with the contrived and unexpected intervention of some new event, character, ability, or object. Rob Spence is the documentary maker who films through a camera fitted into his prosthetic eye. The following is not related to the above project even though it has the same name. An eyeborg or eye-borg is a cybernetic body apparatus which typically fits on the wearer's head, and is designed to allow people to perceive color through sound waves. It is mostly used by blind people or by people with visual impairments such as color blindness or achromatopsia. It works with a head mounted camera that reads the colors directly in front of a person, and converts them in real-time into sound waves. This movie is not related to the above project even though it has the same name. Eyeborgs is a 2009 American science fiction film. It was released on video on July 6, 2010. It may seem to have “ScFy Channel” written all over it, but EYEBORGS turns out to be a well-acted film with an intelligent story and a topical message. my name is barry,i live in london,and through various shocks i found out something unbelievable,and this is where i want to tell you and to find out,if there are any others like me around the world,who have this and for what reason as well.as its very hard to tell anyone less they think im mad.i have a nano type e.t.type of camara in my eye,not my physical eye but my spirit eye within the right eye.and i can look at the sun without getting blinded as well.